Brown the butter in a heavy bottomed saucepan, scraping the pan occasionally. (I usually stand over mine like a mother hen to ensure it doesn’t burn.) It’s done when it’s brown obviously, but the heady, nutty aroma should give you a clue that you’re getting there. Heat the milk in another saucepan until it comes to a gentle simmer. Remove pan from heat and cool for 10 mins. Dump eggs, flour (I sift mine directly into the jar), sugar, salt, liqueur into a blender and beat on medium speed just until you get a smooth batter. Add the milk and butter slowly and give that thing another whirl. Take the batter out and allow it to come to room temperature. Heat a 6-8 inch (whatever suits you) non-stick or seasoned pan. Brush the surface lightly with butter. (I brush my butter stick directly over the pan.) Pour a scant 1/4 cup of batter and lift and swirl the pan quickly but gently so that the batter coats the pan evenly. Cook until the bottom just begins to brown, about 1 min. Then loosen the edge with a knife, pick up the crepe with your fingers and flip it over. (Trust me, this is much easier than it sounds.) Cook the other side for about 10 seconds. Flip the crepe onto a baking sheet/plate lined with parchment. The recipe says to repeat until you have 20 perfect crepes. I don’t know about the perfect, but you will get 20 crepes from the batter. Beat the egg yolks with 1/2 cup sugar over a double boiler at medium speed until pale and think, about 2 mins. (Keep the heat gentle, we don’t want sweet scrambled eggs.) Keep aside to cool. Clean the beaters (don’t be lazy here). Beat egg whites with a pinch of salt just until soft peaks form. Add remaining 1/4 cup sugar a little at a time and beat just until stiff peaks begin to form. Clean the beaters (I know!). Beat cream in another bowl just until soft peaks form. Beat mascarpone and liqueur into the cooled egg yolk mixture just until combined. Fold cream gently into the mixture, then fold in the egg whites. Chill, covered, for 1-2 hours. 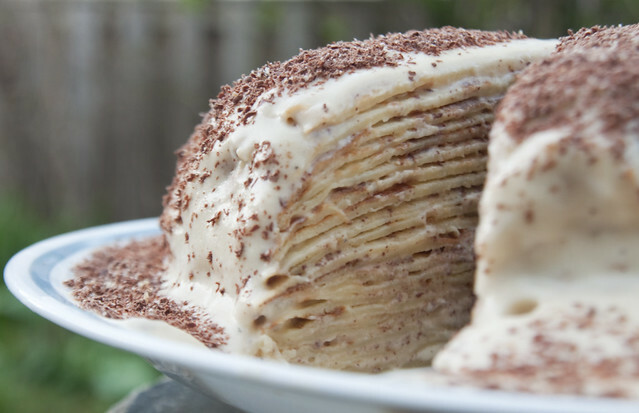 Start with a crepe, spread a thin layer of mascarpone cream over (about 1 1/2 tablespoon) and finely grate chocolate over that. Repeat, finishing with the last crepe. Chill layers and remaining cream for about an hour. Frost the top and sides of the cake with remaining cream. Finely grate chocolate all over.